Proven Winners® ColorChoice® Oso Easy® Urban Legend® Rosa has been awarded the Lord Burleigh Award for Best Disease Resistance, plus the Chauncey Beadle Award for Best Shrub Rose at the 2018 Biltmore International Rose Trials at the Biltmore Estate in Asheville, N.C. The two awards bring the plant’s total to three awards announced this year, having been honored with the 2019 Award of Excellence by the American Rose Society in June. The Biltmore’s Lord Burleigh Award for Best Disease Resistance is named after a descendant of George Vanderbilt, Biltmore’s builder/visionary. Chauncey Beadle, the namesake for the award for best shrub rose, was an avid azalea collector and horticulturist hired at Biltmore in 1890, who later became the estate superintendent. The Biltmore International Rose Trials provides an opportunity for novice and professional breeders to test their selections in a 2-year trial. The roses are grown and observed in the Biltmore’s historic Rose Garden which contains more than 150 varieties from growers and breeders worldwide. They are cared for by Biltmore’s expert horticulturalists and a permanent jury judges the roses four times per year. Eight awards were presented to four rose varieties in the 2018 trials. 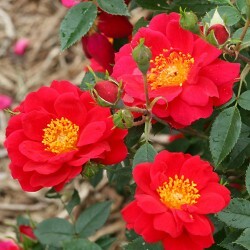 Bred by Christopher Hugh Warner in the United Kingdom and released by Spring Meadow Nursery/Proven Winners® ColorChoice®, Oso Easy® Urban Legend® Rosa is a prolific rebloomer with double, scarlet-red flowers with bright yellow stamens, and is one of 12 varieties in the Oso Easy® rose line.